The most common response to the question “What’s your dream home?” is probably something like “A place in the woods, surrounded by nature.” That’s because many of us equate living deep in the forest or high in the mountains with serenity and, if the house is modernist (or better yet, a modernist take on a log cabin! ), a sort of rustic sophistication. Think of Frank Lloyd Wright’s Fallingwater; hell, even that vampire family’s house in Twilight. But many of us spend as much or more time at work than we do at home. And many of us work in some of the world’s most demoralizing, low-ceilinged buildings in the busiest and smelliest areas of major cities. So, short of becoming a lumberjack, how should today’s cooped-up white-collar employee dream of escaping his or her miserable workspace? 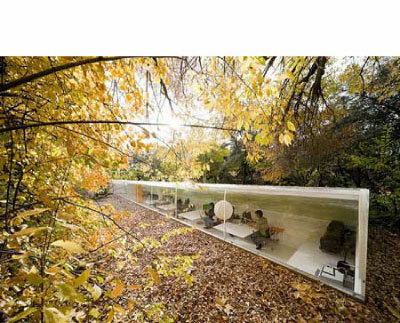 By getting a master’s degree in architecture and applying for a job at Selgascano, a Spanish design firm whose new studio is in the middle of the woods outside Madrid.